In her weekly tourism column in the Inish Times Heidi Woods of Inishowen Tourism talks about 'self-guided walks' within the Inishowen Peninsula. Spring is in the air! By day the sun is shining, by night again recently, the skies are illuminated with the arc of Northern Lights; there is no better time to walk this way. The Inishowen Peninsula beckons the avid explorer, or the gentle dreamer alike; immerse in an experience of discovery and indulge in the unspoilt beauty of nature’s best. One discerning visitor recently stated “just go before everyone else discovers its hidden charm, be the first on this part of “The Wild Atlantic Way”. It is in this vain that we recall some of the “best experiences” that Inishowen has to offer; by referring to the visitor’s perspective. 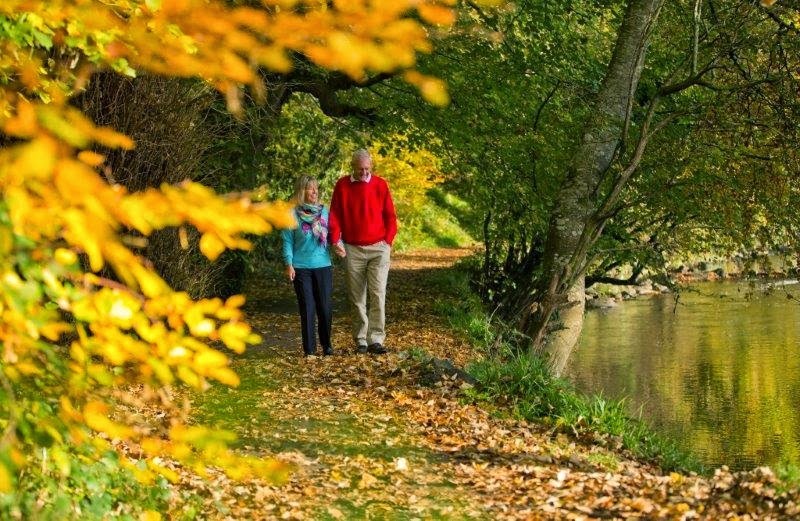 To really experience Inishowen you need to feel it – its land, its rain, it’s bursting rays of sunlight that change in a heartbeat, and most of all, its ability to permeate to the core of your entire being. “Inishowen” should not be rushed, and exploring it with a combination of driving, walking, cycling, climbing, and horseback riding. It offers the individual a variety of ways to experience the opportunity to meet the locals, listen to the legends of a past where residents revere there ancient heritage, and still adhere to their familiar traditions of their ancestors. Choosing the Inishowen Peninsula as a starting point in the Northwest, the journey of a lifetime unfolds. Buncrana, the principal town of Inishowen is a seaside resort with (3miles) 5km of sandy beach. Overlooking the Crana River is the ruins of Buncrana Castle. Three walks were reviewed by people of differing capabilities, what suits one visitor may not another, hence, the grading provides a guide for the serious mountain-hiker, or gentle stroller just going for some fresh air, taking in stunning scenery. 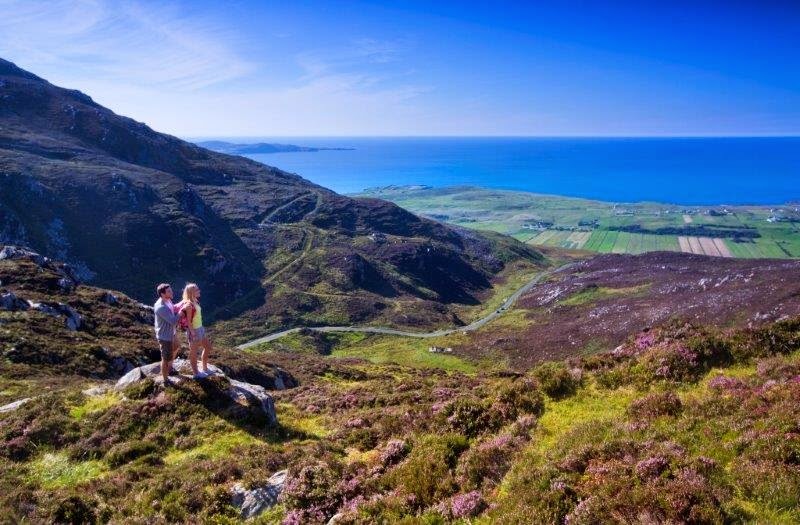 North of Buncrana is the stunning Gap of Mamore, some 250m (820ft) above sea level, with spectacular sea views. For dedicated hill walkers, this is a good starting point for exploring the Urris Hills. It crosses diverse terrain, steep inclines and follows old bog trails that are marked with posts bearing arrows to guide the way. The views overlooking Leenan Bay are not to be missed, it is a place designated by one visitor as “I saw just about everything I expected of Ireland; vast ocean, steep cliffs, heather-filled moors, rolling hills, country homes, grazing sheep, rustic agricultural scenery, and just about every shade of green to fill in the spaces”. Inishowen HeadLoop Trail has a wild and remote feel; as you pass the point from where St. Colmcille left Ireland on his way to Iona (Portkill) and a viewing point from where, on some fine days, the west of Scotland is visible. Walking in this area one visitor states “this is a beautiful little gem of a place...you would nearly not want to tell anyone! All along this coastline is stunning. The further north you go the more beautiful it is”. Whatever path you choose to walk, climb, cycle, or gallop, you cannot lose; your journey of discovery and recovery begins in Inishowen. In Inishowen all walks lead you back to nature and you begin to see beyond.